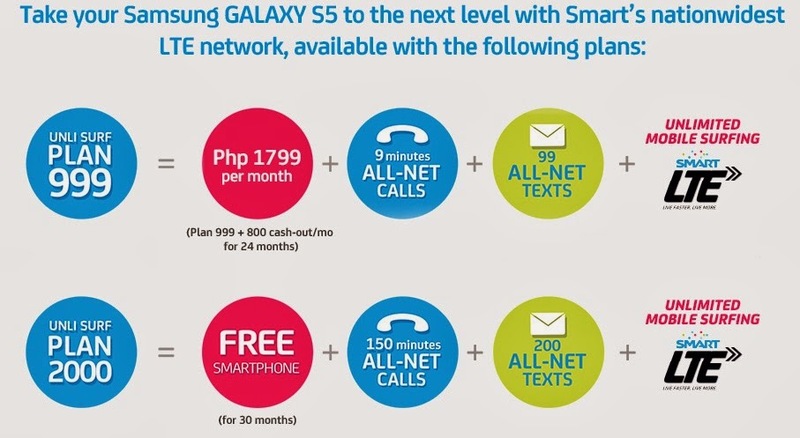 Manila, Philippines - Wireless services leader Smart Communications, Inc. (Smart) has announced today its postpaid plans, pricing, perks for the much awaited Samsung Galaxy S5 as it prepares for flagship device's simultaneous launch in the country on Friday, April 11, 2014. Those interested in acquiring Samsung’s latest flagship device can get one for free at Smart Postpaid’s UnliSurf Plan 2000, which already comes with unlimited mobile LTE surfing, 150 minutes of calls and 200 of texts to all networks under a 30-month contract. Samsung Galaxy S5 will also be available for only P1,799 a month under UnliSurf Plan 999, with P800 monthly handset cash-out for 24 months. This plan comes with unlimited surfing for one month plus calls and texts. Smart's pre-registration page for Samsung Galaxy S5 is now up. You may also check the complete list of postpaid pricing as well as the specs of the next generation smartphone from Samsung on it. Once registered, users will receive constant updates on promos, offers, and details about the local launch of the Galaxy S5 on April 11. Smart said that subscribers who pre-registered and eventually subscribed to a Galaxy S5 plan will get exclusive premium deals from Smart, including free one month unlimited music streaming plus access to millions of tracks via a SPINNR VIP subscription and a chance to win one of ten Samsung Galaxy Gear devices to be raffled off on launch day. 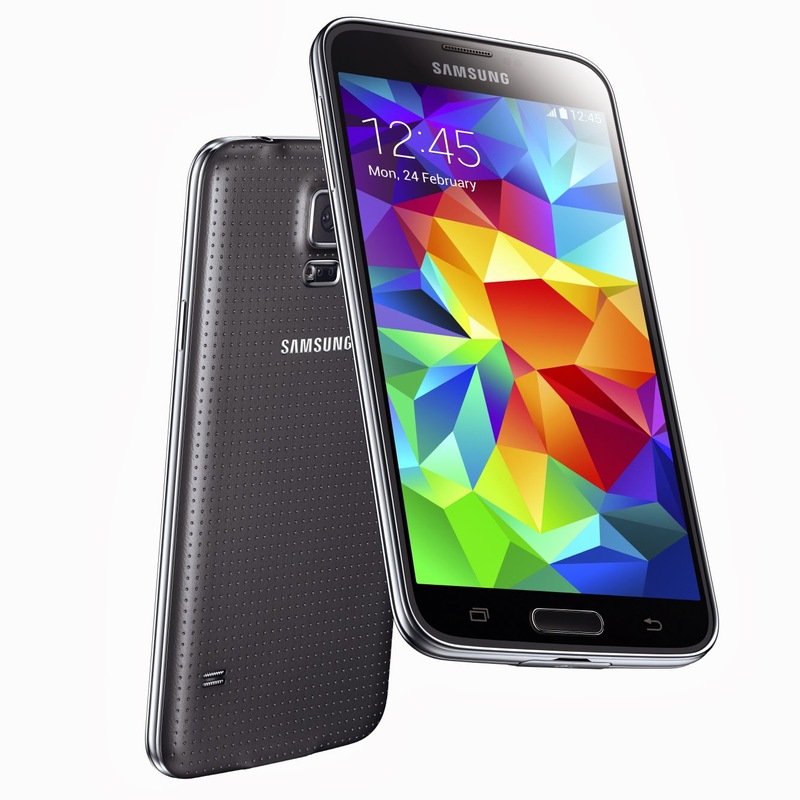 In addition, the first 200 individuals who subscribed to a Samsung Galaxy S5 plan on the first day of availability will be entitled to Smart Gadget Shield, a one-year free handset insurance which covers repair and replacement of the device in case of accidental damage or loss due to theft or robbery. But for those who want to move up to a more exclusive lifestyle, Smart Infinity also offers a host of Samsung Galaxy S5 plan for interested subscribers, starting with the Aspire Plan 3500 which offers the Galaxy S5 for free. Those who want to get more with their device can choose to subscribe to the Prestige Plan 5000, which includes the Samsung Galaxy S5, the Galaxy Gear 2 smartwatch, and a choice of free P5,000 gift certificate or one month free monthly service fee. The Premium Plan 8000 is also available for those who want the complete package, as it comes with the Galaxy S5, the Galaxy Gear 2 smartwatch, and a choice between a 32-inch Samsung Smart TV or P15,000 worth of gift certificates. Being a member of Smart Infinity includes having personalized service and perks such as a personal Infinity Management Officer, access to the 24/7 international concierge service, a vanity number, a backup SIM, a dedicated hotline (*800), and VIP assistance at select stores. Subscribers will also enjoy a variety of premium benefits such as access to premier events, lifestyle offers, and exclusive rewards all year round through their Smart Infinity subscription. These limited-time Samsung Galaxy S5 offers come with the standard 24-month contract, and will only be available until May 11, 2014. To know more on how to avail of these exciting Infinity offers, simply visit http://smart.com.ph/infinity. Unveiled during the Mobile World Congress in Barcelona, Spain in February, Samsung’s latest flagship mobile device features a 5.1-inch 1080p AMOLED display, the latest Qualcomm Snapdragon 801 chip and a 16-megapixel rear camera. Samsung has also updated the look and feel of the Galaxy S5’s chassis and software as it sports a dimpled rear cover and a refreshed look for its trademark TouchWiz user interface. It is available in Electric Blue, Charcoal Black, Shimmer White, and Copper Gold color variants. The Samsung Galaxy S5 also allows ultrafast mobile Internet surfing via LTE connectivity. Smart boasts its widest LTE network around the country as the first Philippine users of the Samsung Galaxy S5 will be able to enjoy blazing-fast Internet connections on their high-end device. Smart said that the network has more than 10,000 4G-capable sites (HSPA+, LTE/LTE-A) nationwide backed by 78,000 kilometers of fiber backhaul, which makes the telco best-equipped to meet the data demands of its most demanding subscribers wherever they are in the country.